WAYout believes in digital media’s potential to empower, give voice, impart information and encourage engagement. 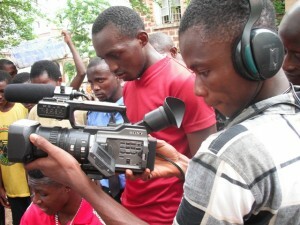 In Sierra Leone we have trained people to make documentaries, promotional films or drama- some of whom now work professionally in media. The targeted audiences range from local community outreach to national or international television. We offer different levels of training from basic introduction for those with no previous knowledge to professional standard for those who want to work in the industry. WAYout has worked with Marie Stopes, Street Child, Pikin Paddy, Advocaid, GOAL, Free Your Mind, Young Hopes Africa, Al Jazeera and iEARN -amongst others. WAYout tutors are either international, award winning, professional filmmakers who work for BBC, Channel 4, Discovery Channel, Al Jazeera and other major broadcasters or Sierra Leoneans who have been trained by those professional filmmakers. WAYout can train people in all the skills they will need to produce videos to use on a multi media platform, to show local, often remote, communities and that can be placed online to raise awareness. We will provide equipment kits that include solar chargers, portable projectors and cameras. In fact everything you will need to work in urban or remote areas. We train on the equipment you invest in so that your trainees are fully familiar with what they are using. A further editing course and investment in editing software and/or laptop is needed if you want to create more professional documentaries or promotional films. Contact info@wayoutarts.org for more information.